Image by Ben Adams via Style me Pretty. The girls. Last year I played a small roll in a very beautifully personal and stylishly fun wedding. I made a maid of honour dress for the lovely Cathy and this week it was included in a DIY wedding feature. The inspirational blog, Style Me Pretty, gives lots of photos of beautiful wedding and events from all over the world. Taire had a vision in her mind and managed on a small budget to bring together a gorgeous look. After speaking to some of the guests afterwards, as expected of this talented girl, felt as good as it looked. Clicking on the top image will take you through to a more complete set of images and a beautiful piece written by Taire about their day. Above all she wanted her wedding to be God honouring, a great day for everyone (young and old) and a joyful. My contribution was very small, but I was so excited to be included in such a beautiful day. Image by Ben Adams. Cathy’s dress and purse. Three upcycled outfits in 3 days. Day 1: Big smile in her skirt into dress....oh and a sneaky owl! 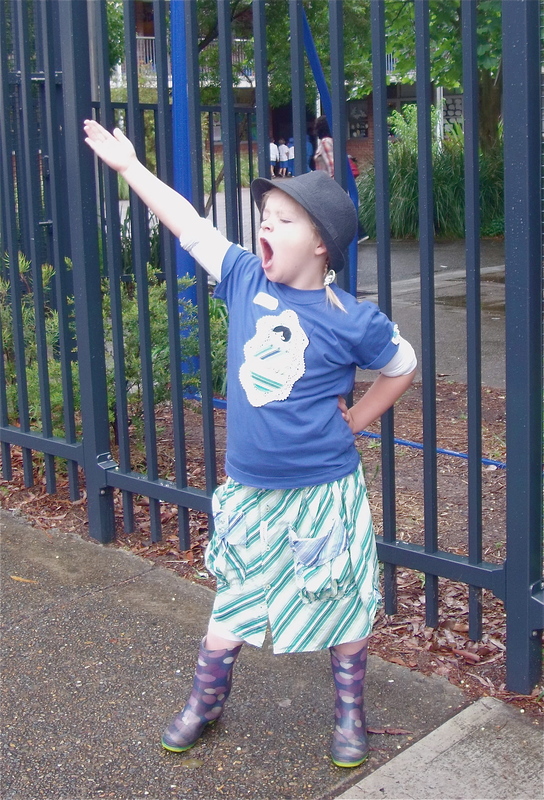 Day 2: A Mary Poppins impersonation before leaving home. 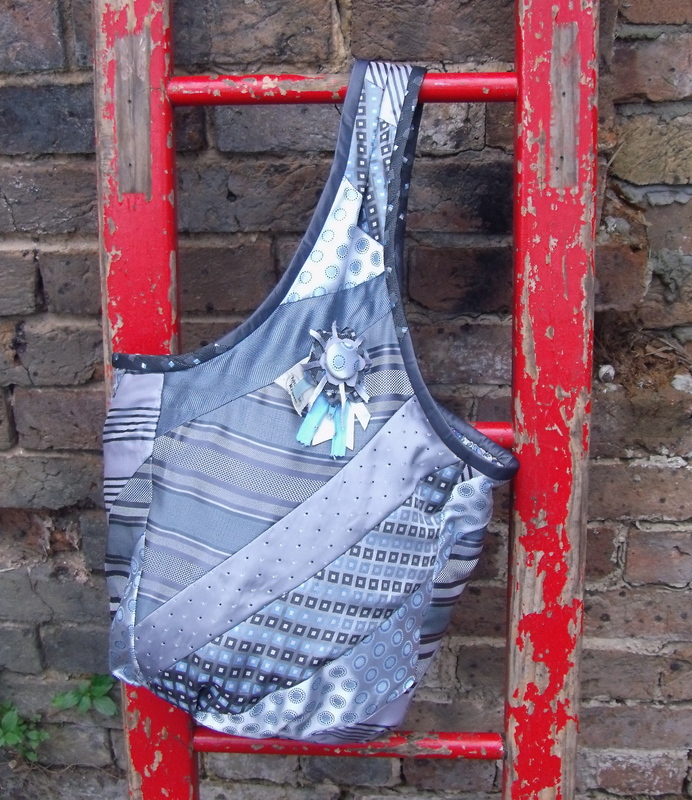 Another skirt made into a dress.... yes and am "Over it" Brooch to finish it off. Day 3: Orientation done! I think a song is in order. Men's shirt into a skirt and top. 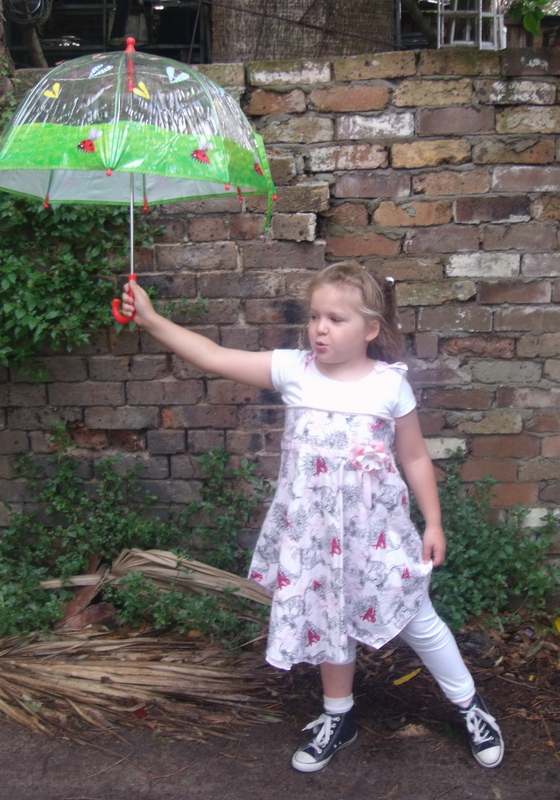 Leading up to orientating 5 year olds to school, she began getting very excited about upcycling skirts into dresses. On a recent trip to the Op Shop, 5 year old bought me the two ladies skirts and suggested we make dresses for her ‘try out days’. She called them this because she was under the impression that she would try it…ask the teachers a few questions (Like what is 2+2… because if they didn’t know, then she thought they wouldn’t make very good teachers)….. Anyway we thought we would turn it into a fun activity together. 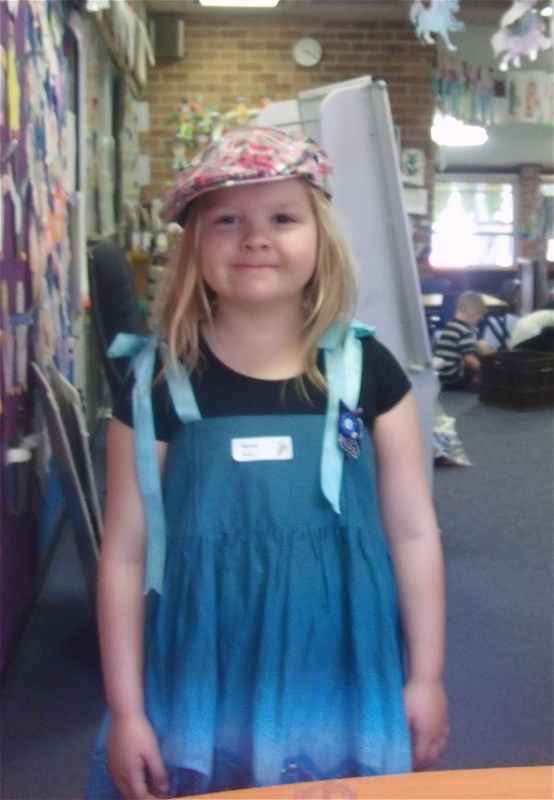 She would pick some pieces from the Op Shop and I would make her some things to wear. While I sewed she sat on the floor and floated around watching and learning what Mummy does. These are what we ended up with! 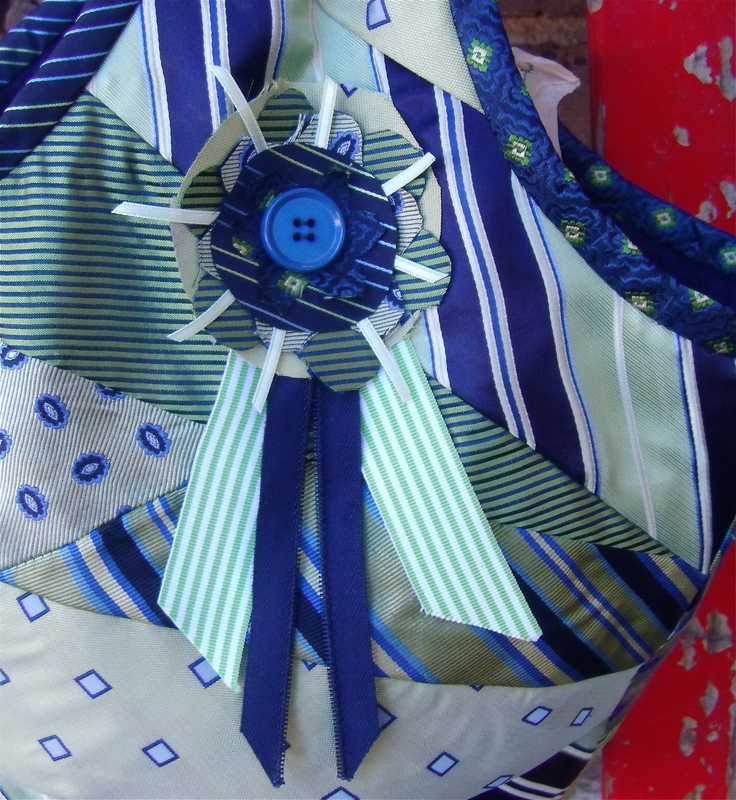 The first one is simply made by attaching ribbons to the top of the skirt and tying them together at the shoulder. With dress two, I made fixed straps with ribbon and attached the ties. 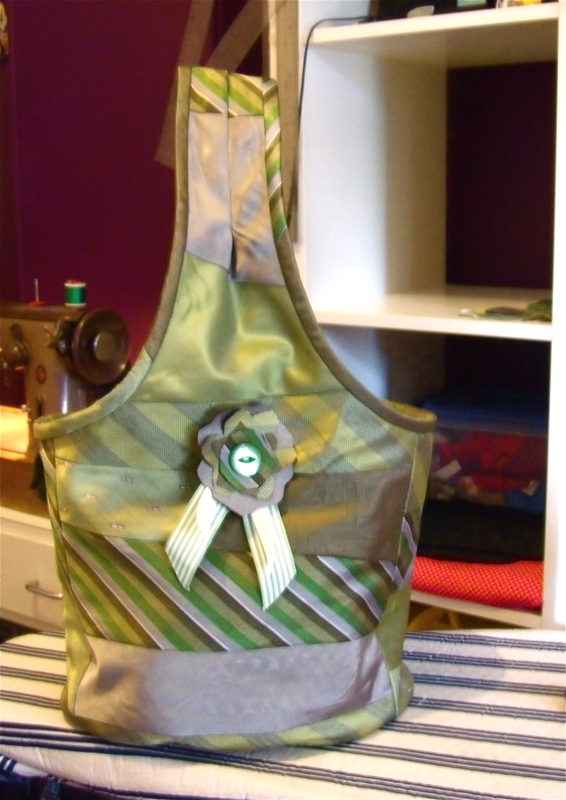 I also added a little ribbon on the skirt yoke to draw the ribbon print into the overall dress. The skirt and top is a little complex to explain in a sentence, but I hope to share a tutorial of how to do it soon. 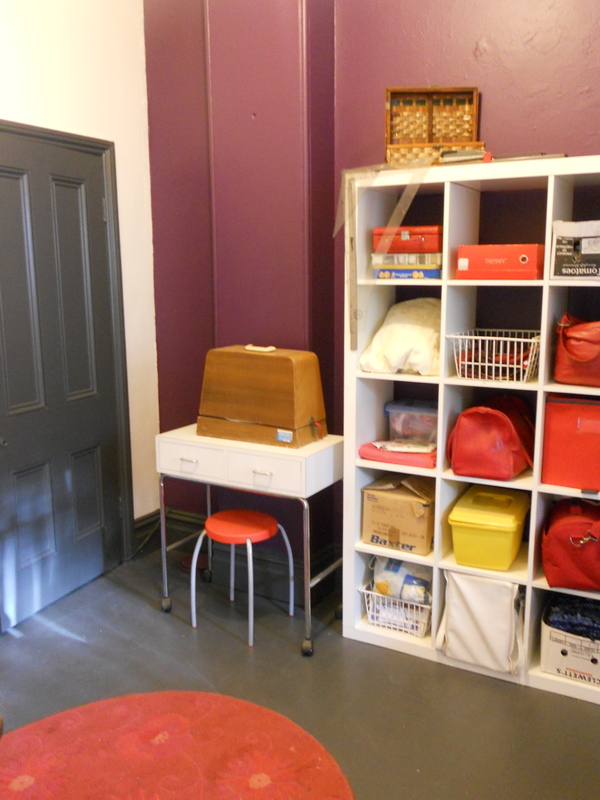 It’s a great (cheap) way to introduce children to sewing…..
New to King Street Newtown. 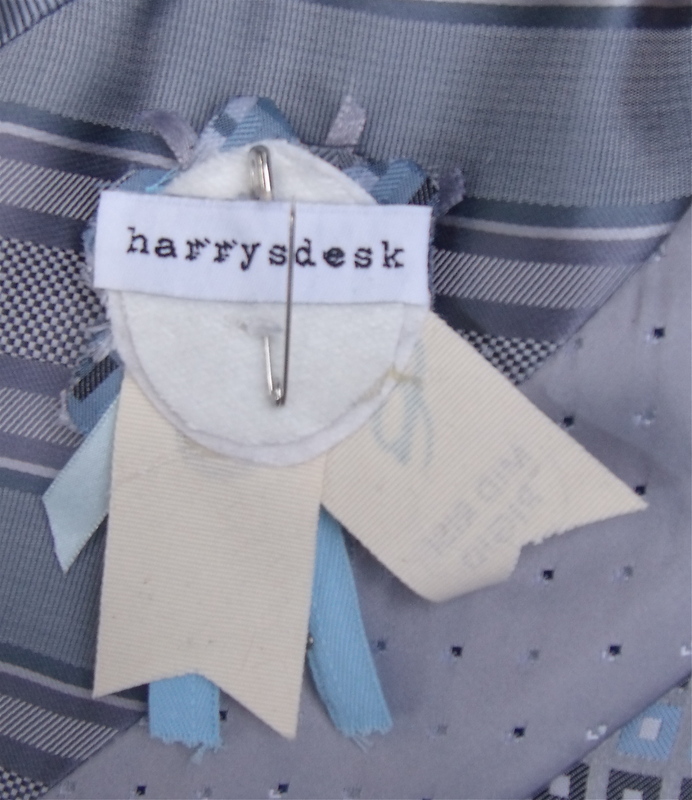 You can now get harrysdesk brooches and hair accessories from LBT King Street Newtown. If you have children size 6 to 14 this shop is well worth a look. Great appropriately styled clothes for this age group. 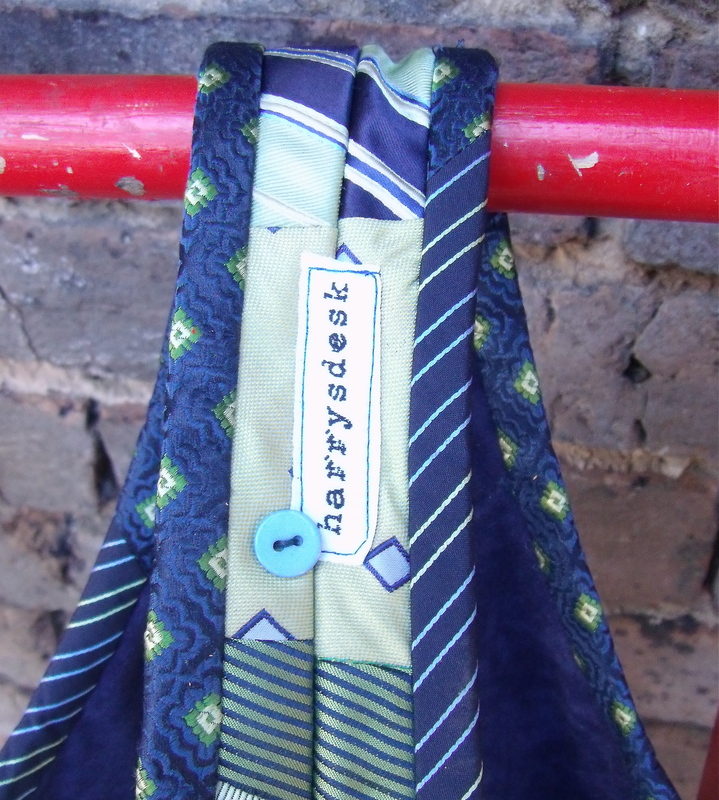 Due to the one off nature of harrysdesk products you will need to pop into the store to see them…. 541 (south) King Street, Newtown walking towards St Peter’s Station….. yes! the groovy end of King Street. For everything else, or if you are a non-local, you can visit the website. 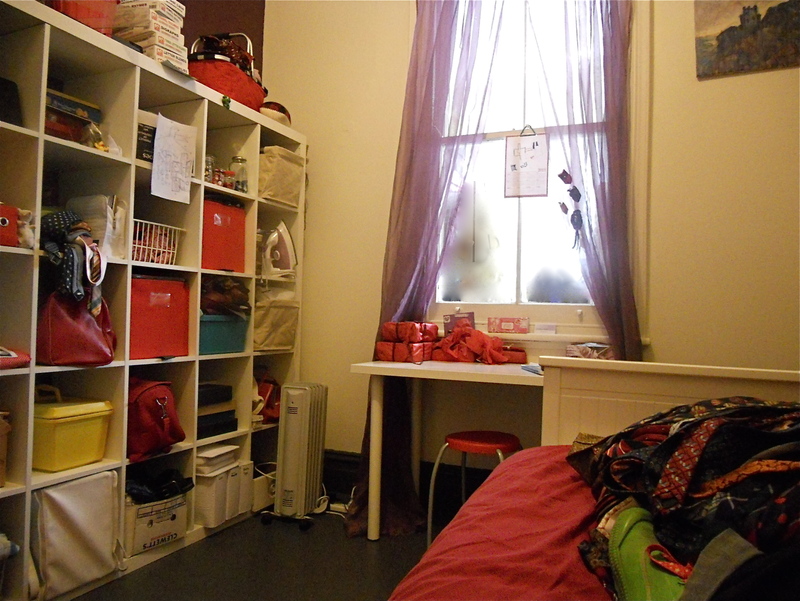 But now….. the room is know as the ‘room of requirement’. Those of you familiar with the Harry Potter books will understand the reference. After having it up and functioning for a couple of months now…. I firmly believe every house needs one. The room becomes what you need it to be….. more on this later. For a time it was known as the ‘spare oom’ (of “The Lion, The witch and The Wardrobe fame)….. but there is nothing spare about this one! 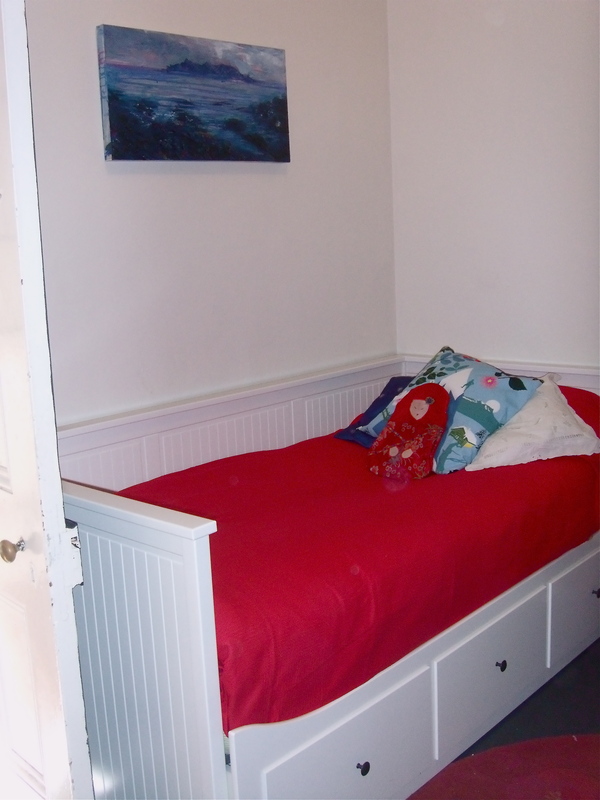 So far it has been used as studio, extra homework space, computer room, guest bedroom for between 1 and 3 guests, a games room, a quiet reading room, a nap during the day room, a sick room (infirmary), a sewing room, a dressing room and a washing rack room. We have loved it! Who knew that a space approx 3m x 3.5 m could change the way our whole house operates. Yes the room has two doors! This shot is looking back from the room to the door leading back the rest of the house. 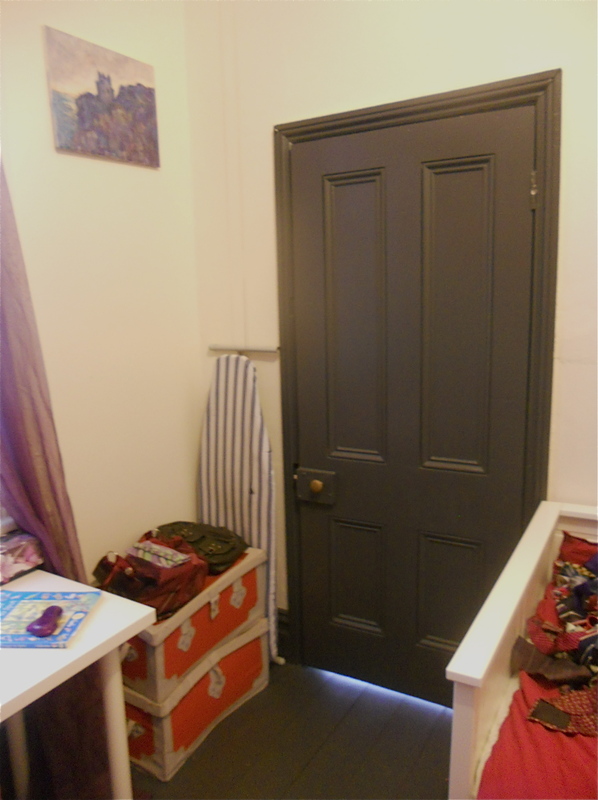 The other grey door (near the sewing machine) is a funny cupboard containing a hot water system and other storage. 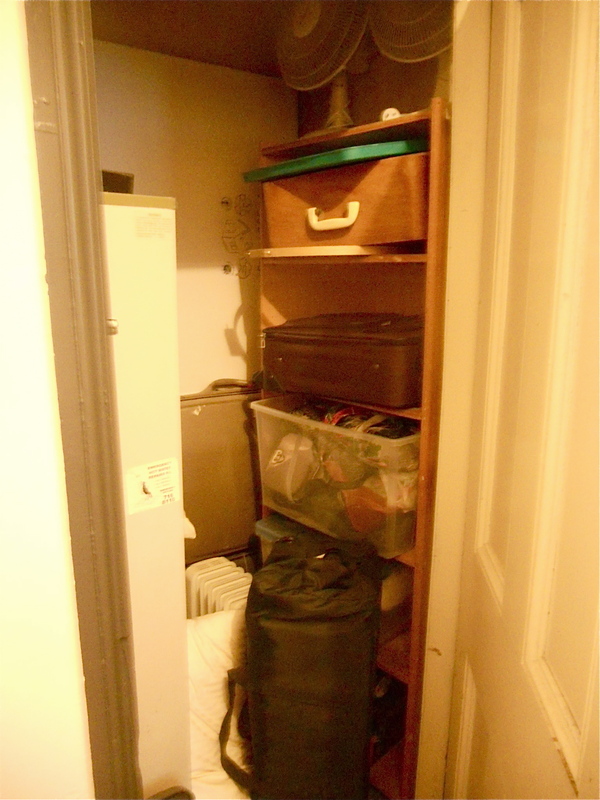 As part of the comment stream on this post I stupidly said I would let you know if i found anything dead…… well I did in this cupboard. A petrified mouse ( and I don’t think their was anything magic about it…. let the reader know…. ) just plain old got stuck behind things and …..well…. didn’t make it! Enough of that….just look at the pretty pictures and forget I said anything! I’m loving the cubes (another Ikea gem…… given to us by a friendly neighbour). 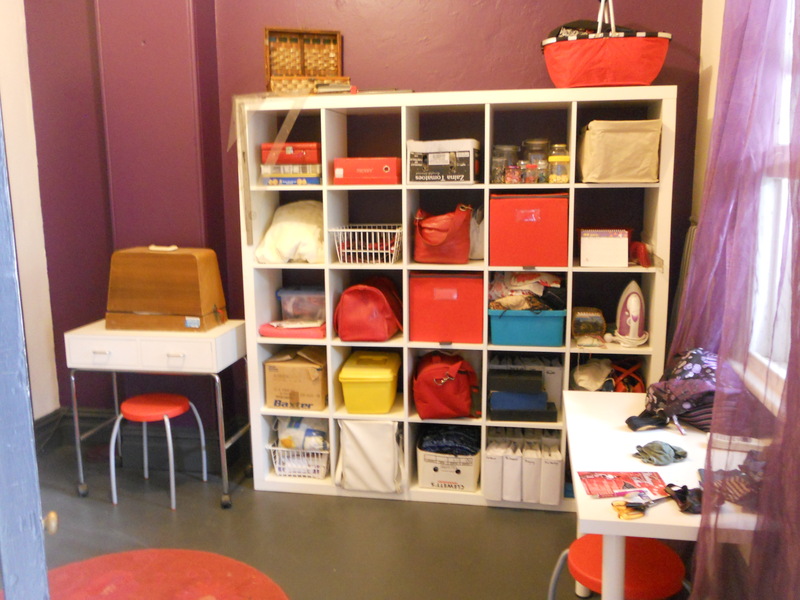 The red bags and boxes have all been found at the op shop over the past year or so. As I see more of them I will replace the cardboard boxes, but I am being patient. So much stuff is thrown away that is perfectly good. No need to buy new here. The cubes work brilliantly for organising the multiple projects that are going on. You will notice the contents of them changes across the days the photos were taken, as I finish one project and other projects come in to replace them. Nothing like a matrix to order a disordered mind! It also gives my brain a sense of progression which I need (sometimes being a mother can feel like ‘Groundhog Day’). ....inside the 'funny cupboard' Yes that's a hot water system...and a squeezed in bookshelf.... along with a travel cot for visiting guests. Price-wise it cost a bit more than the last room. The big, big purchase of this room was the bed. I have been thinking about this bed on and off ever since I first saw it. It’s such an amazing design! 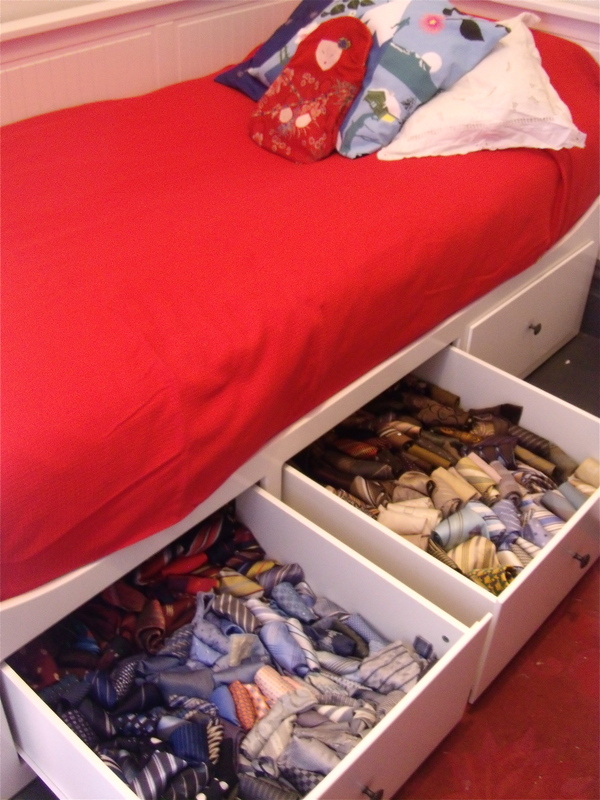 Not just great to look at, but 3 huge underbed draws…… not only that…. 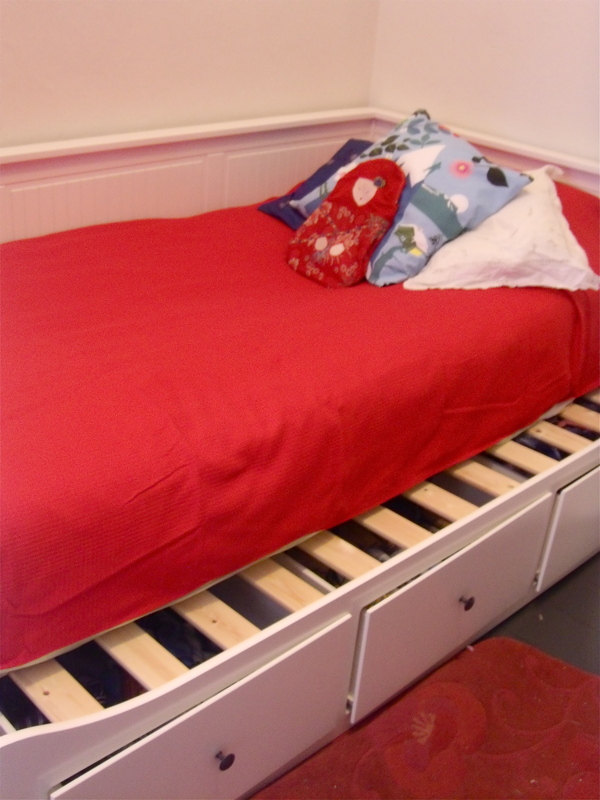 it coverts to a full size queen bed! Perfect for this room. We looked for about a month trying to get one on ebay and gumtree, but they all went for so close to the new purchase price (and we were unsure if we could get it into the room finished) that we decided to buy this one new. It’s Ikea and they come in at around $800 when you buy it with foam matresses. Pretty great we thought. Of course it came needed to be assembled……so it was the first thing I made in the room! Massive (about twice as deep as you can see) draws to store my ties. We also bought the small desk (again ikea) for around $40. Everything else in the room we already had….. scattered throughout the house. So all together about $960. .... laying on the bed looking back toward the window... (yes that's my lime green shoe in the foreground). This photo was taken on a different day. See my little owls and foxes on the curtain? 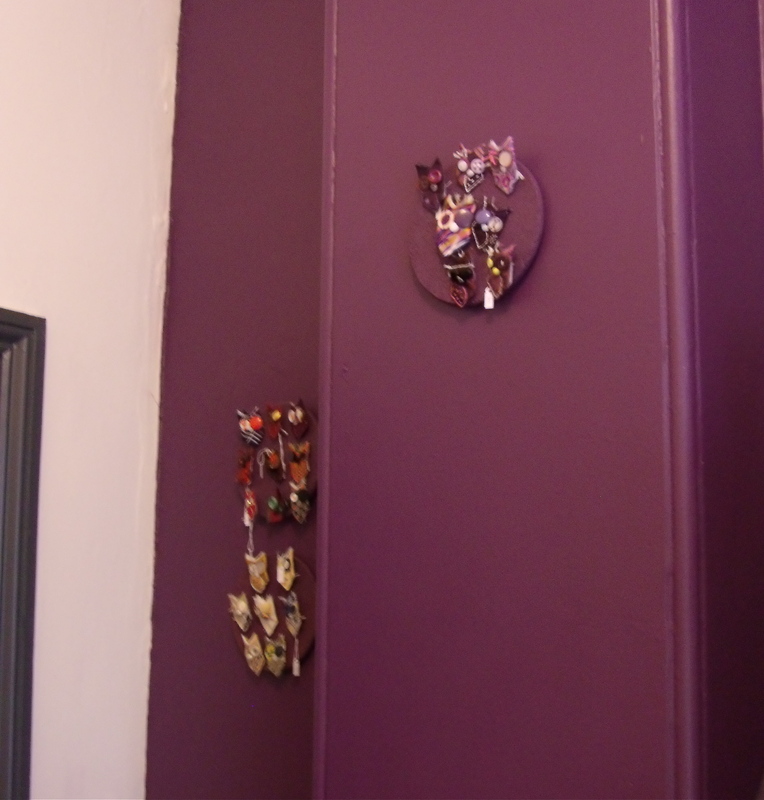 Ideally I would have put the bed on the purple wall so I could see more of it….. but it just won’t fit . This is the only configuration the funny little room will do with all it’s doors and wall jutting and giant power point. I really enjoy being in here and really love it that we essentially have a guest room! Who would have thought that could be possible in a 3 bedroom flat (with 6 people living there already). 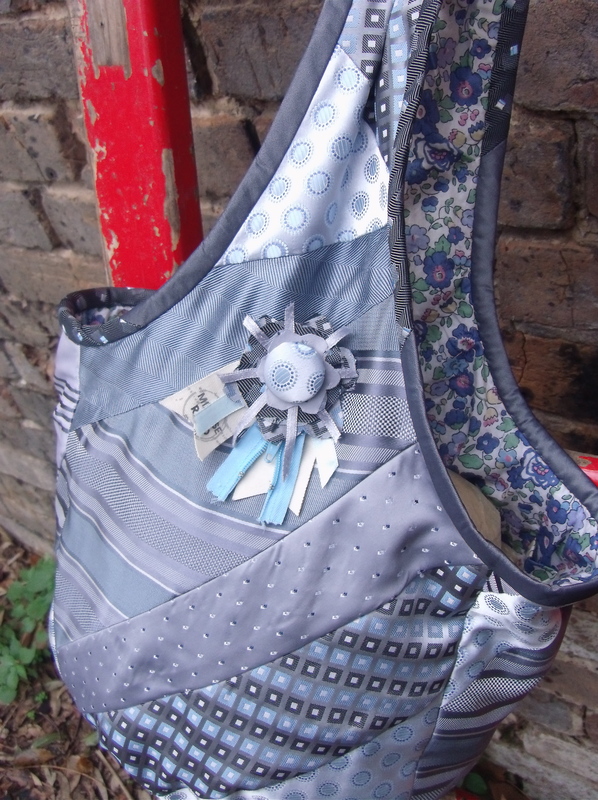 Silvery grey Penhall..... with floral lining. 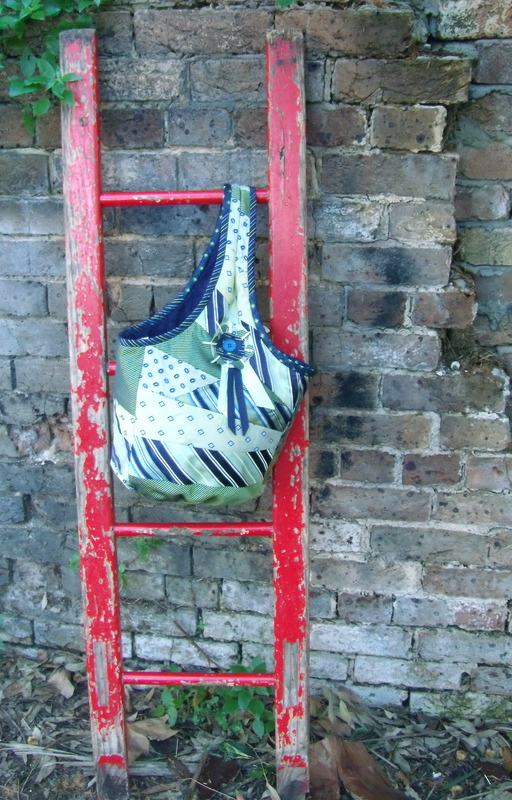 It’s the second promised bag made using the colours inspired by you. You can see the green and blue version here. 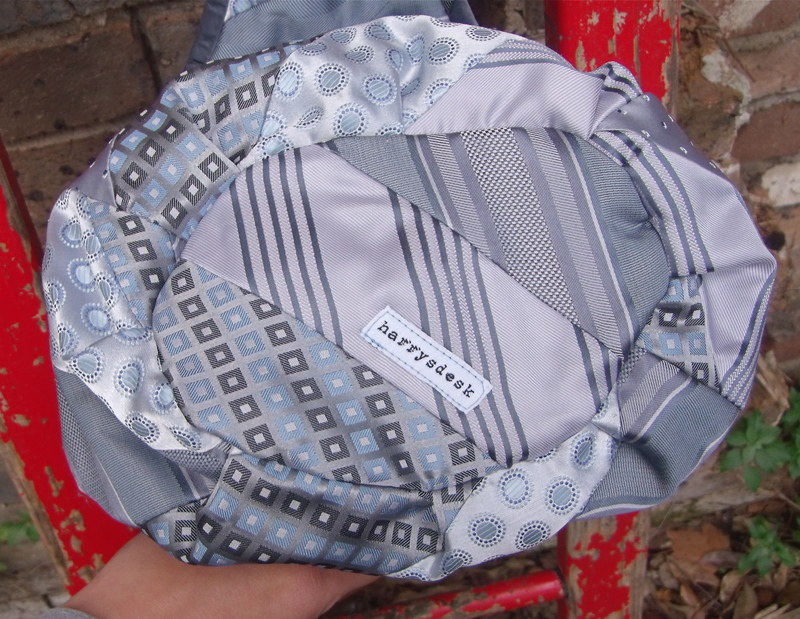 I’m loving it, and was glad of the opportunity to put a silver grey bag together….as I have been wanting to use this colour combo for a while. 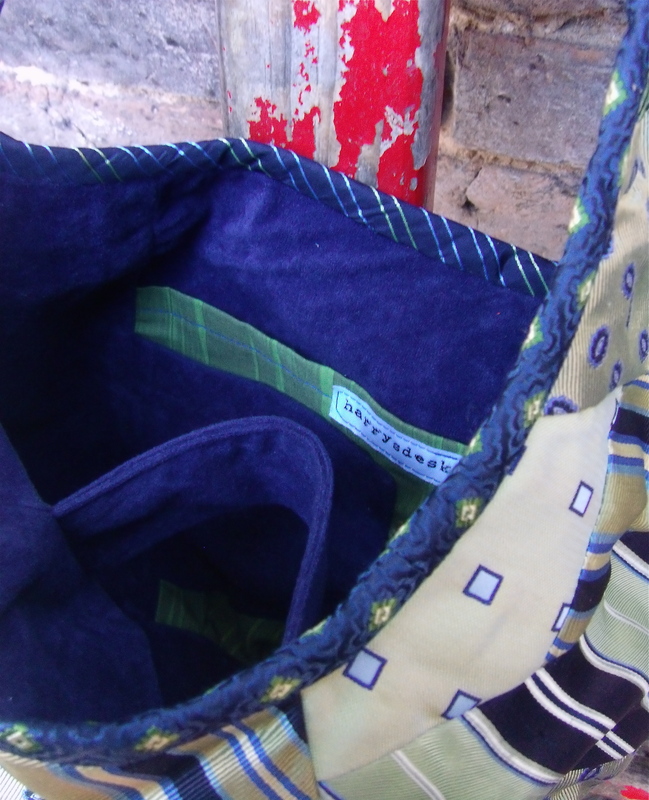 The bag is also completely reversible. 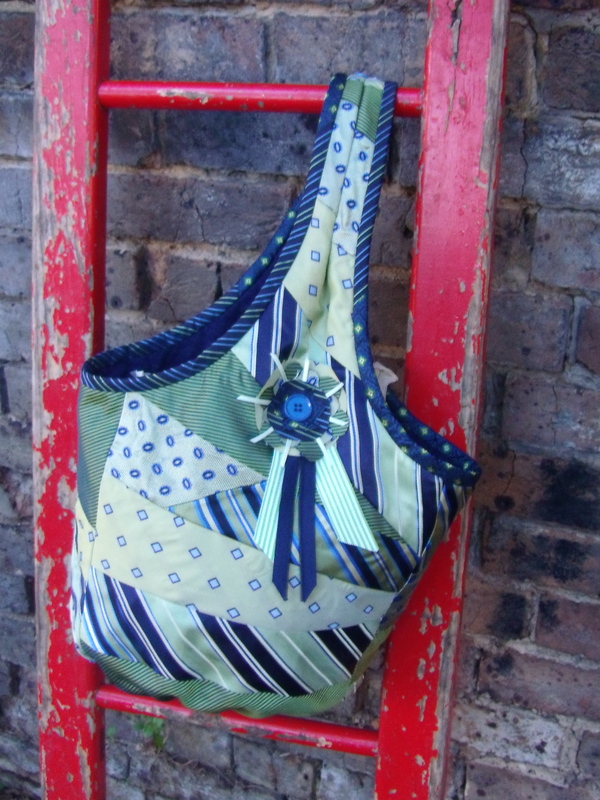 The other side is lined with a liberty-esque floral in blue green and grey tones with a touch of pink….so it’s a bit girlie. The Penhall is now available. Even closer. 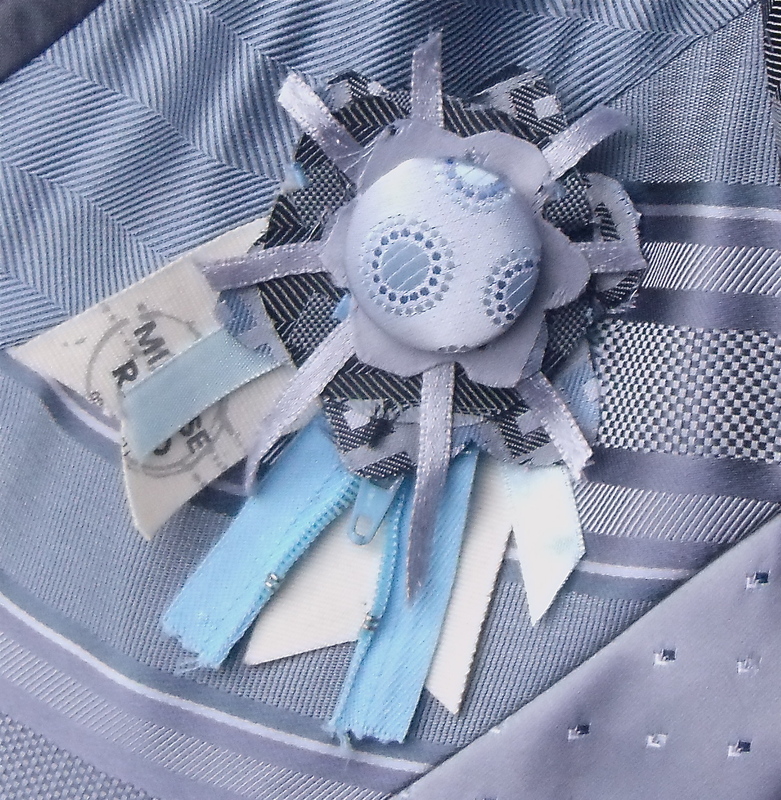 Rosette brooch detail. But wait...there's more.... it's totally reversible! 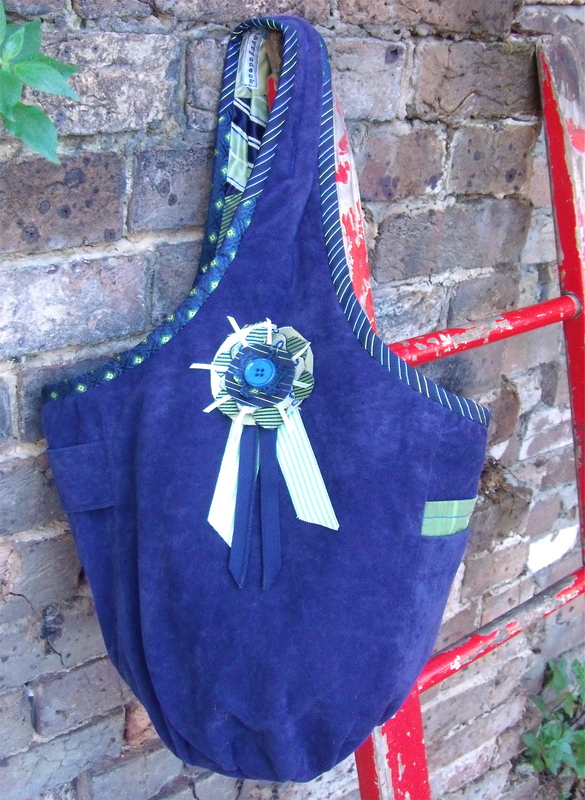 Even switch the rosette to the navy side. ....and of course....it's a harrysdesk. Lots of you will have an extra 10% discount on this price…and some even 20%….. due to the special anniversary bag give-away. Thanks again to those who entered. If you would like to sling this on your shoulder (or someone that you know) let me know and I will give you your special code word, so you can access your discount. For a more detailed description and measurements ….. go here. 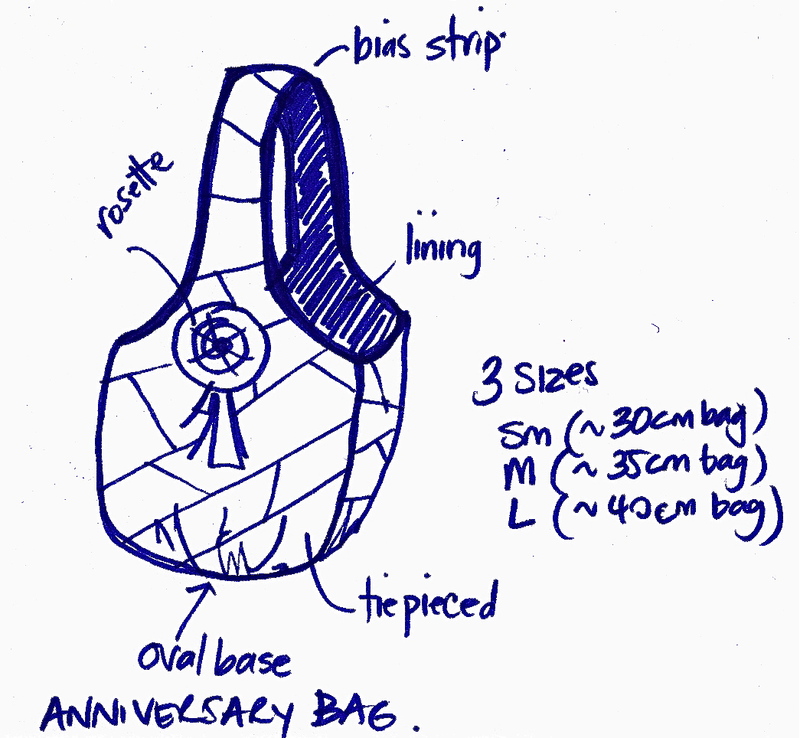 The first of the anniversay bags is done…. and delivered. Although the 5 years old says it looks like an upside down pair of undies, I have resisted the urge to name them knickers, undies or y-fronts…. or to enter into any conversation with her about who these ‘undies’ would fit…. even though she would love to. 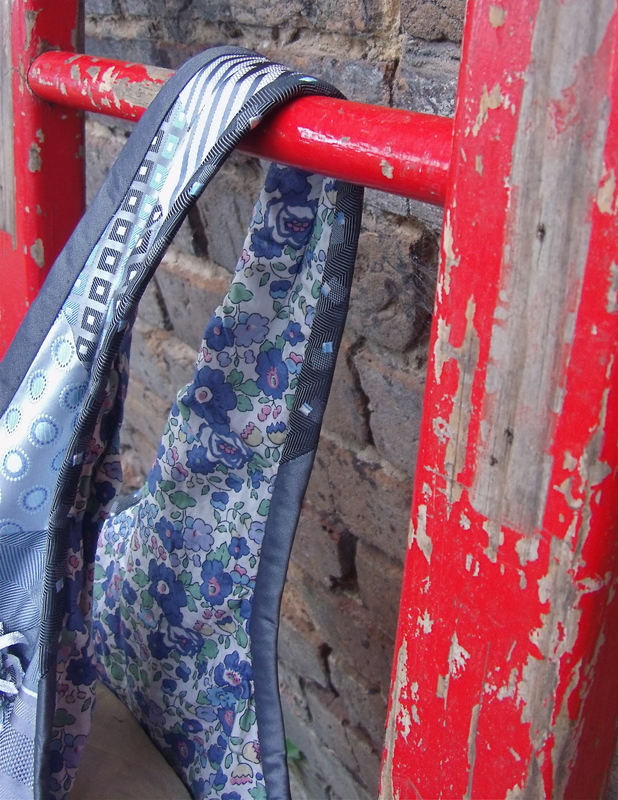 The Penhall bag in small and medium. I added a button clasp which pulls the sides in a little. No. 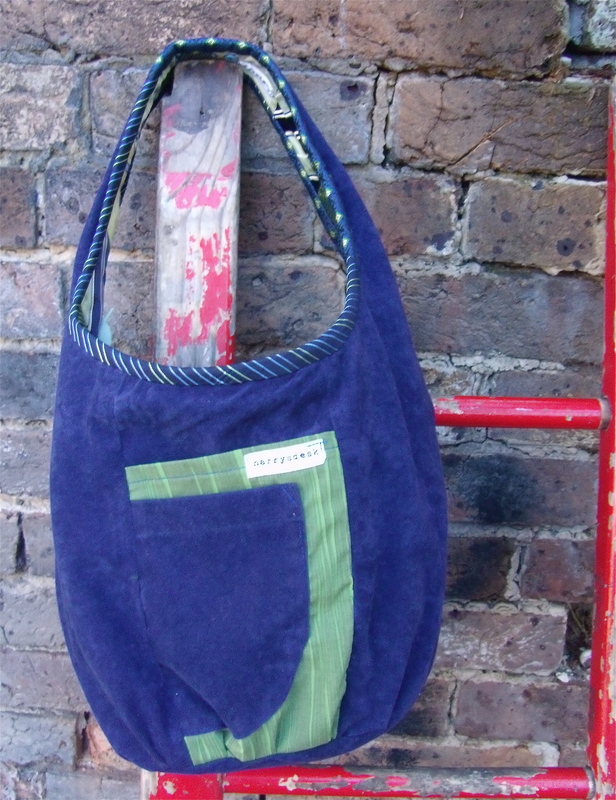 The new bag will be called the ‘Penhall’. Customarily I name new bags by the surname of the first person to own that style. Because …. as I mentioned earlier, Heidi already has a bag named after her….the “Broadbent’ (her married name) so this time I have used her maiden name. So …introducing the “Penhall” with absolutely no reference to undies!….I think it’s best. 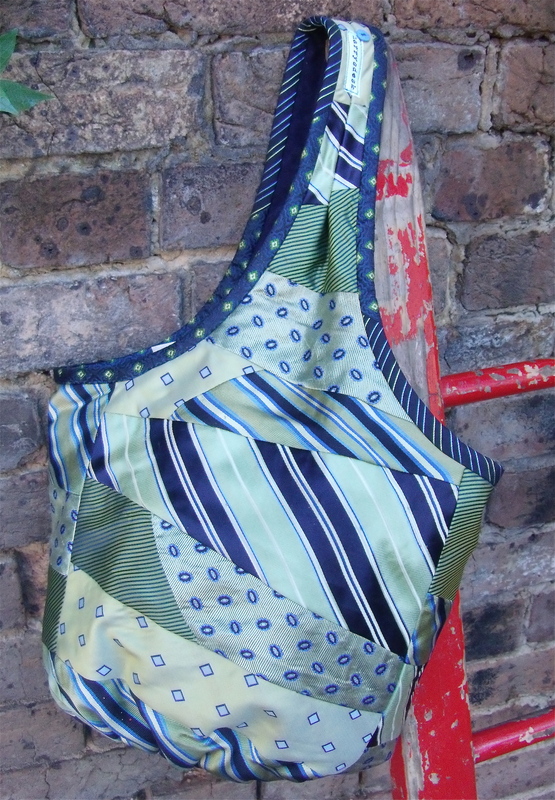 Now I better get cracking on the etsy ones…..
Did you win the anniversary bag? Heidi is the winner of the anniversary bag! The random generator must know something…. 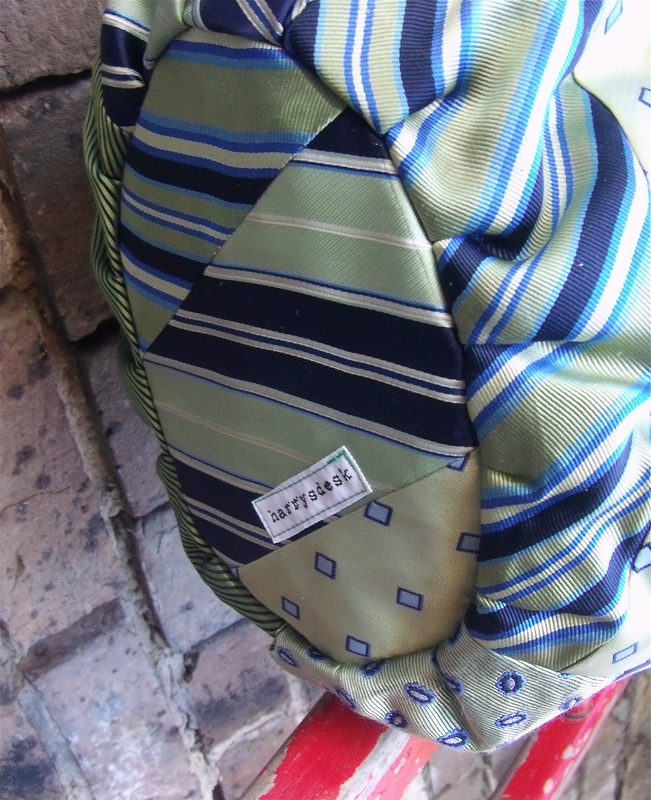 Heidi was the first person ever to buy a harrysdesk bag. So I guess it’s kind of fitting that she win the 2 year anniversary bag. She already has a bag named after her…so not sure what we will do about that one. 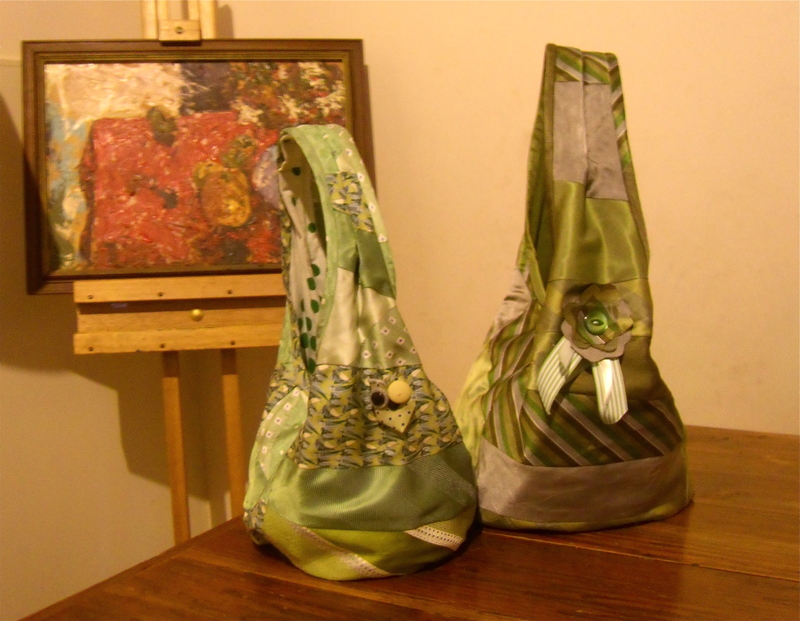 She wanted a green bag to go with her winter coat, so I had better get busy. I love giving things away that I make… so I decided to award 3 more people (chosen randomly) to send a little something to. An owl brooch will arrive in the post for you soon. They are Lauren, Sonyabossypants, and Claire. And three more little treats, because it’s my 500th post. Ingrid, Cathy and Kate Marquez will all receive my latest creation. 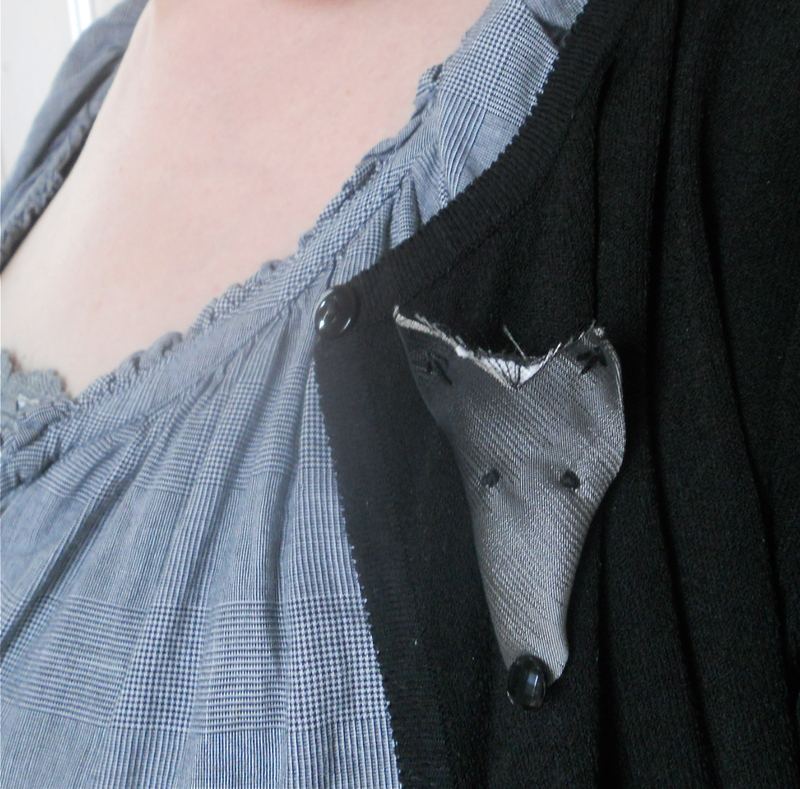 The fox brooch! If anyone else would like a little fox for their cardi or coat….just contact me. It will take a little bit of time to get them listed in the etsy shop…. but there is really no need to wait.